I had such a great weekend celebrating my mother and mother-in-law. It just so happened that the tickets to Mamma Mia I gave my mom for Christmas fell on Mother’s Day weekend. Add to that an amazing dinner at our favorite Italian spot and lunch the next day with family and it just doesn’t get much better. I have to admit I was pretty impressed with the lunch I served. The key – casual, simple and pretty. This dish was so easy because it required no cooking in my actual kitchen, minimal usage of pots and pans and was perfect to serve family style at the table which allowed me to be with my family instead of stuck in the kitchen cooking and plating food. Here’s how it went down. I mixed grape tomatoes (or cherry tomatoes) with red onion, cilantro, olive oil, chili power, cumin, salt & pepper. (If you haven’t realized by now, this is not the place to get recipes with exact measurements… just season it to taste and make enough to serve however many people you’re feeding. I did this step when I woke up Sunday morning so it would be one less thing to do when lunch came around. As mealtime approached, we heated up the grill. I brushed the corn with a little olive oil and salted it before placing on the grill husk side down. We left them on for about 12 minutes or so. I just kept an eye on them and took them off when they started to blacken on the edges. Next, the chicken goes on. I marinated mine overnight with a super simple marinade. Olive oil, lime juice & a packet of fajita seasoning. It’s seriously so easy and tastes delicious. While G grilled the chicken (about 6-8 minutes on each side….some of the chicken breasts were huge), I shaved the corn off the cob & into my already marinating tomato & red onion mixture. I added a little lime juice at this point as well. I didn’t put the lime juice in that morning because I was worried it would marinate the tomatoes into an mushy consistency. Then I seasoned a little more to taste. 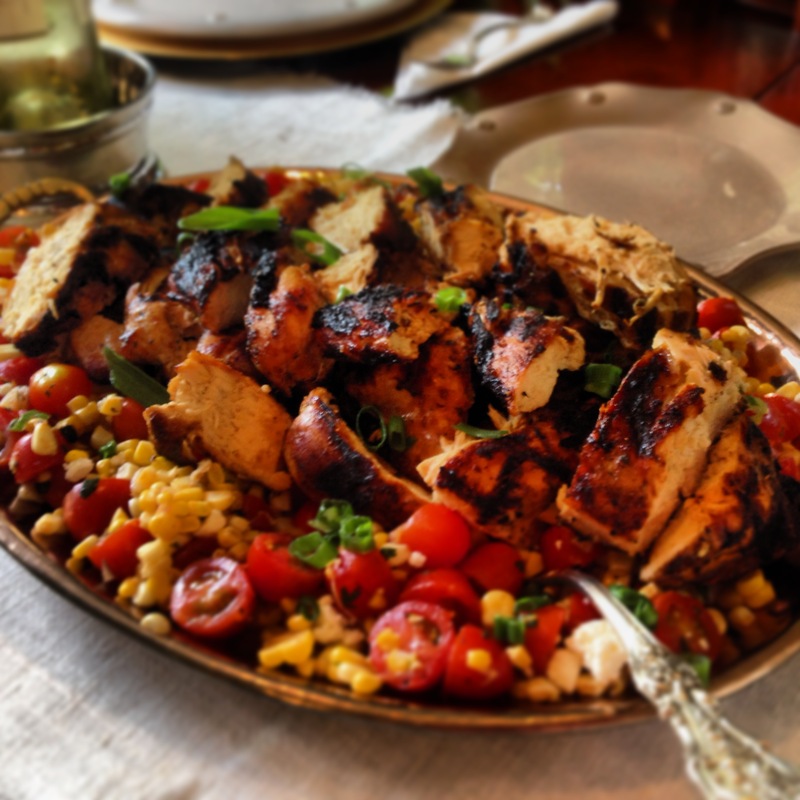 I spread the corn & tomato salad onto a copper platter and then topped with the grilled chicken which I sliced. Then sprinkled a little green onion & feta and it was all set!! I served this with a peach/feta/walnut salad and it was the perfect lunch. Not too heavy with just enough room for dessert!